Take the Adventure, heed the call, now ere the irrevocable moment passes! Dan Waugh has climbed in the Caucasus and Central Asia, as well as closer to home in the Cascades. In 1991, he was on a Mountaineers/Soviet Alpine Federation exchange climb on Peak Lenin (7134m.) in the Pamirs. In 1993, he led REI Adventures clients to the summit of Mt. Elbrus in the Caucasus and in 1994 was a member of Tom Hargis's successful expedition to Gasherbrum II (8034m.) in the Karakoram. He has led treks in the Pamir-Alai Range of Kyrgyzstan ( most recently, for Mountain Travel/Sobek) and a mountain bike adventure through the mountains of Kyrgyzstan, across the Torugart Pass to Kashgar, and then down the Karakoram Highway to Gilgit in Pakistan. 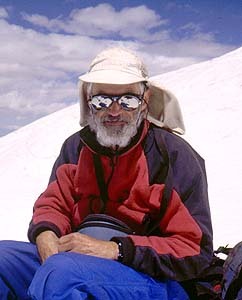 In 1996, at age 54, he solo trekked in the mountains east of Kongur (7719m.) in Xinjiang, explored the unknown southeast side of Mustagh Ata (7546m. ), and summited on Mustagh Ata as a member of a group led by Andrei Ershov of St. Petersburg, Russia. The trek around Kongur was written up in The Himalayan Journal, Vol. 54 (1998), and further details were published in the November 1999 issue of The Geographical Journal. In the summer of 1999, he attempted 7000 m. Khan Tengri in the Tien Shan range of Kyrgyzstan. Dan's other outdoor activities include orienteering. In real life, Dan teaches Russian and Central Asian history at the University of Washington, where until recently he chaired the Russian, East European and Central Asian Studies Program. He is currently teaching a new course on the Silk Road, the preparation for which took him to Dunhuang, China, in 1998 for a month-long seminar devoted to the Buddhist art in the Mogao Caves and sponsored by the Silk Road Foundation. Click here for his academic CV. He is also on the board of directors of Center for Civil Society International, for which he has co-edited with M. Holt Ruffin Civil Society in Central Asia, published in 1999 by the University of Washington Press.